Acacia Park Cemetery and Mausoleum is a mid-sized cemetery with a Masonic design, located at 7800 W. Irving Park Road in Chicago. To its south, across Irving Park Road, is Irving Park Cemtery. 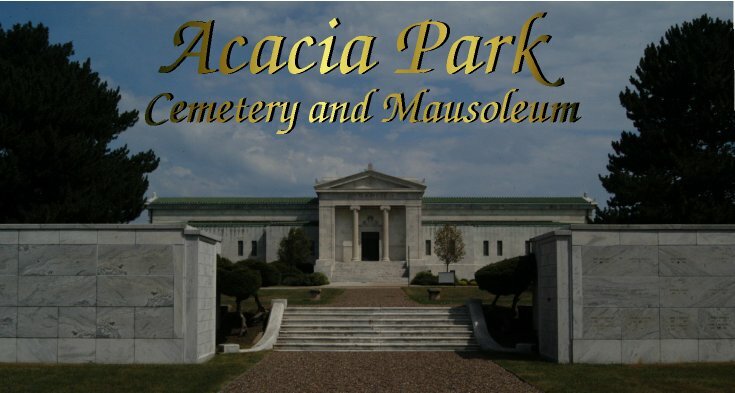 On the north side, Acacia Park adjoins Westlawn Cemetery; the gates in the fence dividing Acacia Park and Westlawn are usually open, and one may pass freely between them. Acacia Park Cemetery has a very symmetrical and orderly design. There are two entrances along the south perimiter. A short distance north of each entrance is a small hill, each topped with a statue and obelisk bearing the Masonic symbol. Between the obelisks is a recessed garden leading to a beautiful classical mausoleum - one of the finest in the Chicago area.